Neil Young has been called a lot of things over the span of his 40-year music career. Best-selling artist. Third most influential songwriter in pop music history (after the Beatles and Dylan). An enigma. The godfather of grunge. Washed up. A genius. A national treasure (in Canada and the U.S.). In this class, Trinity parishioner Joe Rose argues that Young should have a new title: Preacher. 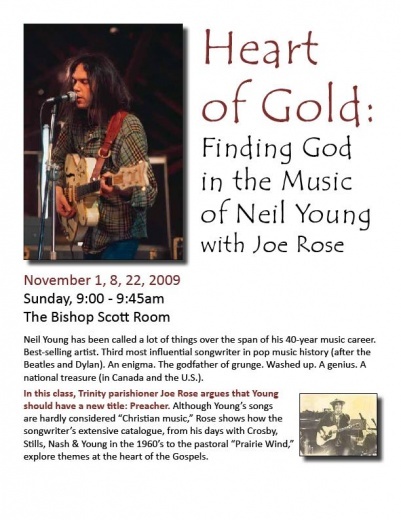 Although Young's songs are hardly considered “Christian music,” Rose shows how the songwriter's extensive catalog, from his days with Crosby, Stills, Nash & Young in the 1960's to the pastoral “Prairie Wind,” explore themes at the heart of the Gospels. Respecting Neil's beliefs and position, I'm not going to stretch the lyrics and music into something they're not. Rather, I want to talk about the spiritual concept of "the seeker," using Neil and his music -- from young man to aging man -- as an example of how we all are searching for meaning on a spiritual level. In some cases, I will talk about how Neil Young's music has calmed rough sees for me and enriched my faith when it comes to my outlook on life and humanity. At different phases of his career, Neil has been like Job, King David and St. Francis, to name a few, full of love but not afraid to shout at God and show the rest of us how we are sliding off grace's highway. It will be a multimedia presentation incorporating lyrics, video and audio -- and a lot of reflection on the words and music. I hope Rusties in the Portland area can make it. Sounds enlightening Joe. Let us know how it goes. And here's what Neil thought "When God Made Me". I'll post a PowerPoint file of the presentation when the classes wrap up. Today was fantastic. I nice crowd (about 40 people, transcending generations) and great discussion, especially about "Thrasher" and "Heart of Gold." In a nutshell, we talked about Neil's faith (I played the clip from Charlie Rose), talked about learning lessons from the Gospels from teachers outside the church and compared Neil's music to St. Francis' words. A lot of skeptics about the Neil-God connection going in who said they'll be back next week. We compared Neil's life to the story of St. Francis. There are so many similarities. We also discussed the story of Francis shedding his rich man's clothes to help the poor and preach about nature to the line "burned my credit cards for gas." Songs discussed: Heart of Gold (Neil the seeker), Thrasher (farming, nature and land as metaphor, and the conflict of modernity and the soul), Southern Man (social justice and St. Francis' teaching: "It is no use walking anywhere to preach unless our walking is our preaching”) and "Ohio" (again, social justice). Hope you can make it, Greg. Yes, just as St. Francis based much of his ministry on nature. This class is an exercise in how it's healthy too look outside the ghetto of the church to find "preachers" of the truth, to explore words and messages that strengthen our beliefs and bring comfort, and to be open-minded. It's not a class about how Neil's music is "Christian" as much as one about the revelations of the divine in all places. As the rockandtheology.com blog stated: It's an exercise in finding "the cathedral in Neil." Peace. I can't wait to discuss that song on the 22nd. Ever study any Larry Norman? I appreciate the tie-ins to the Gospel. However, as a professional writer with an American literature degree, I find that this is not unusual in great literature and, by the same token, great lyrics. I'm a life-long Neil Young fan. What makes his lyrics so universally appealing and heartfelt are that most touch on the core themes of literature inherent to Judeo/Christian North American/European culture--love and loss, to name a few, which are echoed through visually stimulating images. Most of this literature has its roots in Judeo/Christian values, which stem from the Gospel and Old Testament. In fact, if you look at famous works of literature, there are very clear ties to these values. Yes, there is a Neil/God/spirtual connection and I totaly agree with what everyone is saying. But this is something that great writers possess--and there are only a few of those in the music world. Neil Young's words and wisdom have enriched my life and I don't think I'd want it any other way. One more thing. Did you say you were posting a link to your Powerpoint presentation? I live in the NY area and would LOVE to see it. When do you plan on doing that? Thanks. I'll post the full PowerPoint after the last class.